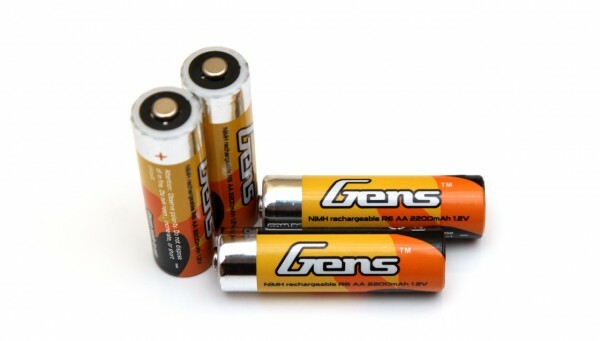 The 1.2V AA 2200 mAh Gens Ace NiMH batteries we got here for testing are of the LSD (Low Self Discharge) type and offer a good balance in terms of capacity and price, not the highest one for LSD NiMH batteries, but also these come at a price of about half of that of the highest capacity LSD NiMH batteries out there. We’ve seen mostly good results from various Gens Ace LiPo batteries so far, and now it is time to see how well they are doing with NiMH batteries. Unfortunately they offer only AA size NiMH batteries, the ones tested here, so there are no other options currently available for example AAA or 9V. These Gens Ace batteries are rated as 2200 mAh, but there is no information about typical and minimum guaranteed capacity, though the suppose that they are 2200 mAh typical and 2100 mAh minimum capacity. Starting the tests of the 1.2V AA 2200 mAh Gens Ace NiMH batteries with a low constant current discharge rate of 0.2A got us 2098 mAh as useable capacity or with other words pretty much what their supposed minimum capacity should be. Just in case we have repeated the test with multiple different batteries and all of them ended up at about 2100 mAh useable capacity – still a good, but not a great result. Increasing the constant current load to 0.5A and 1.0A we still got very good results with useable capacity that is very close and even at 2.0A the Gens Ace battery still manages to provide a lot of capacity. The results, although slightly disappointing in terms of maximum useable capacity at low loads (we expected a bit more from Gens Ace), still show very good performance for both low and high load applications. And thanks to the good price these batteries may be a suitable choice for people looking for good high capacity LSD NiMH batteries available at a more affordable price and not looking for the best and highest possible capacity models that do cost more and may not offer that much more in terms of performance.